Shanghai will host IMTCE 2013, the first ever Medical Tourism trade show to take place in China. Professionals representing a wide array of healthcare sectors, and media partners such as myMEDholiday.com, will come together to examine industry trends and the potential for the Chinese medical travel market. Later this summer, Shanghai will play host to the inaugural International Medical Tourism Conference & Exhibition (IMTCE), the first of its kind to take place in China. It promises to be one of the larger trade shows to-date for this booming industry, and leading medical tourism portal myMEDholiday.com has garnered an invitation to act as one of a short list of media partners. The exhibition is to be held from September 12th-13th in Shanghai, and will feature representatives from an impressive roster of the industry’s leading hospitals and clinics, medical tourism facilitators and travel agencies, healthcare associations, insurance companies, and medical-travel marketing firms. A variety of professionals from different medical tourism fields are scheduled to address the conference’s attendees, including medical travel consultants and advocates, insurance experts, and government health policy authorities. The conference’s aim is to focus on the current trends in medical tourism, and provide a platform for businesses in the medical travel space to network and create partnerships with their industry colleagues. Key topics of the IMTCE exhibition include how healthcare facilities can best work with their associates overseas, how medical tourism destinations can successfully brand their product, how different sectors of a country’s medical system can attract international patients, and, importantly, how to understand the healthcare system and market potential in China. As this segment continues to grow, gaining insight into the opportunities to attract Chinese medical tourists, learning about their expectations for healthcare services, and understanding their needs as patients will be a primary focus of medical travel businesses. A high level marketing representative for myMEDholiday.com says, “IMTCE 2013 in Shanghai should be exciting and informative. It will go a long way towards helping those of us in the medical tourism industry enter into the Chinese market.” Anyone seeking more information about this landmark event, or interested in becoming a sponsor or exhibitor should visit http://www.imtce-china.com. 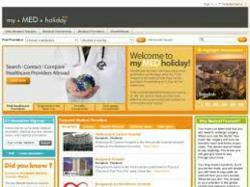 myMEDholiday.com is a comprehensive Medical Tourism portal and ratings site with offices in San Francisco, CA and Bangkok, Thailand. They provide direct access to detailed information about top medical and healthcare facilities around the world, giving patients the tools to locate, compare and contact medical travel or medical tourism providers quickly and conveniently. Their management team has over 15 years of experience with online travel and internet marketing, and has implemented a wide range of successful websites and e-marketing campaigns, and their aim is to work on behalf of patients and give them the information needed to make the right choices, while helping them find a safe, effective and cost-saving alternative for their health and medical needs.